Your dog shows you unending loyalty and love, so mix it up and reward Fido with something other than a chewy treat. Try do-it-yourself accessories to capture your pup’s personality, handmade toys to keep him entertained, and home-sewn furnishings to make sure he’s always snuggled. Test out any of the next 14 fresh ideas to help you spoil your pup in new and creative ways. A plush dog bone toy that's homemade will save you money at the pet store and keep your pup entertained for hours of fun. You can take the extra step to fill it with dried peas or beans to create a fun rattling noise. Just be sure to keep an eye on the toy if your dog tends to destroy their favorite chewables – once the stuffing starts coming out, take it away. Adult dogs need 12 to 14 hours of sleep per day, so it may be time to refresh your pet’s bed. Thrift a vintage suitcase, disassemble, and fill with a lush pillow or cushion. DIYing your dog bed allows you to customize the colors and patterns to compliment your home decor. Snip a few tired or torn tees into fabric strips, then braid together for a colorful chewy toy. This tutorial gives patterns for two different braiding techniques, so stick with it! These are actually easily mastered after a couple of practice knots. Your four-legged friend deserves to eat in just as much style as you, so look to this step-by-step to craft a chic bowl holder from scratch. While this project is relatively straightforward, it does require the use of a jigsaw and the better part of an afternoon to come together. Bonus: the bowls pop easily out of this stand for quick cleanup. 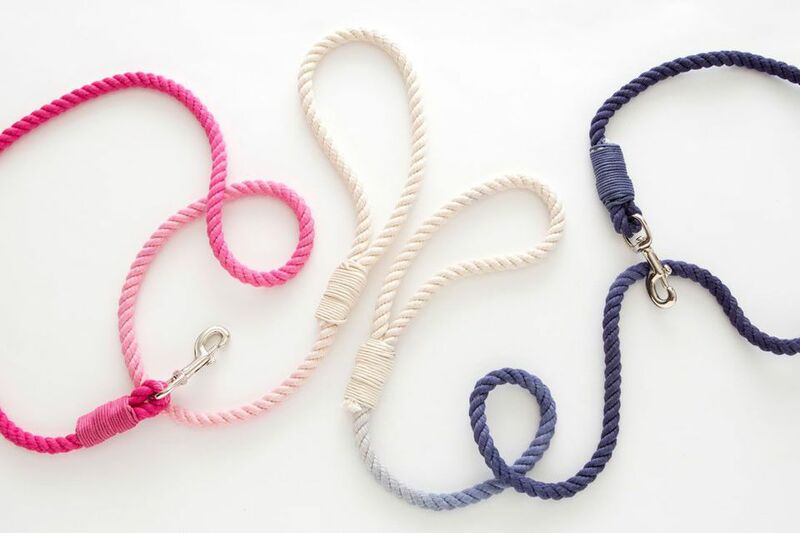 Dye a plain rope dog leash a rainbow of colors using a tie-dye kit or fabric dye. Mix the dyes according to package instructions, then water them down a bit for a less intense finish. Pro tip: overlap the dyed sections slightly for a more blended, ombre effect. This easy-to-sew dog coat will keep your pint-sized pup nice and warm in the winter! The fleece lining is soft and comfortable while the outer layer will protect against wind and cold. Not to mention, your dog will look so cute in his little jacket! Looking for something a little more lightweight than a dog coat for those brisk fall days? Keep Fido warm during cool weather walks by transforming an old knit sweater into a cozy dog pullover. This tutorial includes a complete, detailed, printable sewing pattern, and is available in three different sizes to accommodate most smaller pets. Change the look of your pet’s collar by designing a few different sleeves to slip over it. Simply measure a swatch of fabric to fit, then hot glue it into a tube, and decorate with ribbon, rhinestones, or ricrac. Your puppy will be ready for any occasion with a few of these stylish no-sew sleeves on hand. Bring a little magic to your morning walk with this unicorn horn DIY! Use felt for a majority of the piece (and so you won’t have to hem any raw edges), and add some flair with shimmery trim or faux flowers. Add an elastic band to fit your pup’s head and you’ve got one fantastic pet accessory. Replace a more expensive engraved metal dog tag with this budget-friendly do-it-yourself option. Roll out a bit of clay and use a small cookie cutter or ring mold to cut it to shape, then stamp or free-hand your pet’s identification information. Use silver, bronze, or gold clay to fully mimic a shiny metal tag. Training a puppy can be tough, but if you’re working with a crate system, why not make it more bearable by styling things up a bit? Frame a regular wire crate in stained wood, add a table top and fabric curtains, and what started as an eyesore easily becomes a beautiful part of your family room. This project can be super wallet-friendly when using scrapped wood and leftover fabric. A seasonal bandana for your pup shows his playful side and welcomes friendly interaction at the dog park. Stitch up a few in various patterns to slip over Fido’s collar, and they'll stay secure during even the most robust game of fetch. Avoid a pet hair mess on your vehicle’s seats with this practical car blanket. Thanks to its over-the-seat straps, this cover stays in place even when Fido doesn’t. While sewing this blanket will admittedly take a bit of patience (and a sewing machine), you’ll save yourself the frustration of vacuuming out the backseat after each vet appointment or doggy daycare drop off. Shelter your dog from the backyard summer sun by constructing a quick teepee. Use a weather-resistant fabric (a coated linen or vinyl work well) to cover bamboo poles, and toss an old blanket or pillow in the base for a bit of cushion.